Plumbing manifolds distribute hot and cold water to appliances around the property. 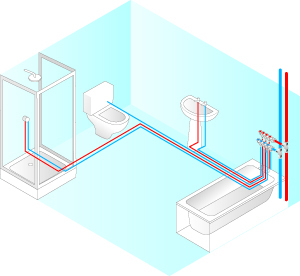 Pipes run from the manifold to each piece of sanitary wear (such as sinks, baths, washing machines) in continuous loops to and from the manifold so that there are no fittings in the system other than at the appliance and manifold. Using a manifold system has the added benefit of allowing for individual flow control and in the event of a problem the individual isolation of appliances, whilst leaving the rest of the system fully operational. Essentially manifold plumbing allows for every appliance in a building to be connected from manifold to appliance with no fittings in between, under a floor or over a ceiling, completely removing the possibility of joint leaks. It means that the manifold becomes to plumbing what the consumer box is to electrics, in that as each appliance has its own circuit of pipework, if the appliance leaks or is faulty that circuit can simply be turned ‘off’. Manifold connection takes the panic out of plumbing; you haven’t got water pouring into a building in an uncontrolled way, it’s not turn off the stopcock and leave you stranded while you wait for an emergency call. For the installer it can mean fewer emergency callouts particularly over the holiday period. Individual isolation – each appliance can be isolated in the event of a problem. Fewer joints in the system – reducing the possibility of leaks. Accessibility – The only connections are at the appliance and the manifold (usually located in an airing cupboard or under a sink, etc). There are no joints under floorboards or inside walls. Reduced installation time – Eliminating intermediate joints speeds up installation time. Easy to maintain – with individual isolation of each appliance and easy accessibility, maintenance or repair work is much easier. Flexibility – Allows adjustment of flow and tailoring of pipe sizes for individual appliances. Easy to use – Safe, secure and improved control over the buildings plumbing.